on earth by completing the work you gave me to do. Father, bring me into the glory we shared before the world began. I have passed on to them the message you gave me. they believe you sent me. the world, but to keep them safe from the evil one. be made holy by your truth. you. And may they be in us so that the world will believe you sent me. 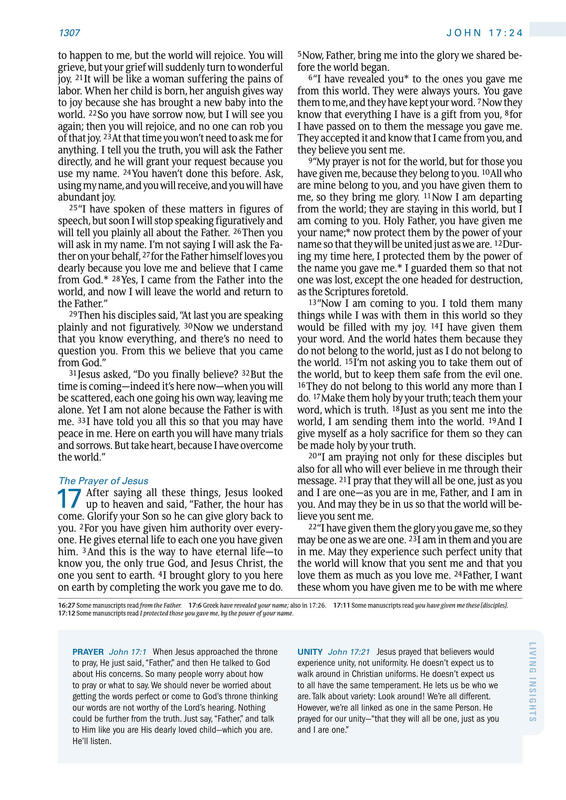 16:27 Some manuscripts read from the Father. 17:6 Greek have revealed your name; also in 17:26. 17:11 Some manuscripts read you have given me these [disciples]. 17:12 Some manuscripts read I protected those you gave me, by the power of your name. to Him like you are His dearly loved ­child—­which you are. are. Talk about variety: Look around! We’re all different.